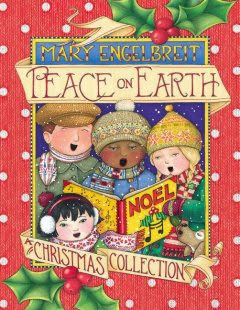 Mary Engelbreit’s Peace on Earth: A Christmas Collection is a 2013 children’s book, her celebration of what she loves about Christmas. This isn’t a collection of stories—Peace on Earth is comprised of the text of various Christmas hymns, the accounts of the birth of Jesus from Luke and the visit of the magi from Matthew, and numerous poems and short essays from other authors, all with illustrations and borders by Engelbreit. This latter is, of course, why nearly everyone who picks this book up does so, and Engelbreit’s art is quite good, as you’d expect. Her style is distinct, her colors are warm and vibrant, and, with the exception of the fact that she misspells “magi” in one of her illustrations, everything looks excellent. But while the art is great, the text is largely unimpressive and uninteresting. The hymns we know already, and many of the poems—nothing else really stands out, and you can read through this book in about five minutes. Neither my wife nor my three-and-a-half-year-old daughter, both of whom are big fans of other Engelbreit works, were particularly impressed with Peace on Earth, although they did enjoy looking at the pictures once or twice. Peace on Earth is perfectly good if you’re looking for a collection of Engelbreit’s Christmas art. But don’t ask it for any more than that.